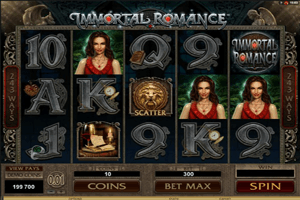 Immortal Romance is a 243 ways to win video slot machine that is developed by Microgaming. It was one of the early games that were themed around the word of the vicious and blood sucking vampires. The game was released following the great success of vampire movies and TV shows such as True blood, Twilight and Underworld. The game allows players to experience a whole new side to the vampire world, instead of blood and gore, it allows them to experience romance and love. Play Immortal Romance Slot here. The game has a high paying format of 243 ways to win that are spread across the five reels of the game. The icons appearing on those reels are all related to the theme of the game as they include the logo of the game, an ancient spell book, a golden door knob, an ancient mansion as well as the main characters of the game, Amber, Troy, Sarah and Michael. The game offers players huge payouts, whether through the game’s regular payouts or the special icons that it has. The logo of the game is wild and can substitute for any of the other icons while doubling the winning. The Golden Door knob is the scatter symbol that can trigger the Chamber of spins where players will earn a number of free spins with multipliers, extra wilds and much more.